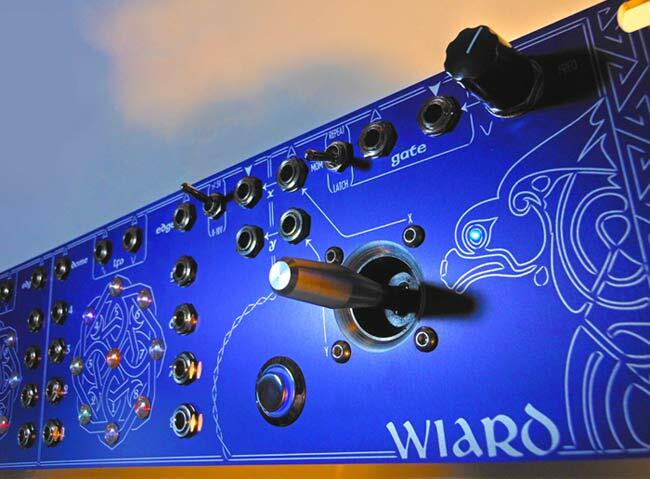 MUFF WIGGLER :: View topic - New for 2013: The 311C Dual JAG Controller! New for 2013: The 311C Dual JAG Controller! The emerald style/looking LEDs = Gorgeous! I always loved to use the Malekko Wiard/Richter oscillator as LFO with the JAG, and having a dedicated LFO with sine/cosine is just what the doctor ordered. I'm from the school of thought that less human control can often be a good thing! Although I am inclined to want to touch this module. The comparator on gate input is another subtle but major addition to the 300 format. Wogglebug smooth or stepped doesn't work happily with the Sequantizer whose inputs are designed to work with gates from the SQ steps.... and TBH the Sequantizer really comes alive when interpatched and the CV options are patched from external sources. The jumper switch to use the latched gate repeat mode saves using a Mixolator or the crossfader on the Envelator for this functon. One of the reasons for the additional modes (though there are all sorts of possibilities) is for translating one of the on-board LFOs into a Sequencer clock. This frees up other modules for more interesting tasks. I have been experimenting with patching up this unit with a Sequantizer and one VCO, and it's quite amazing what can be done with only two modules and the 311C. Planning some demo videos! Was just thinking along that line, too (use as a clock). One thing I haven't found in any articles about the JAG so far (although I may just have missed it) is whether the JAG itself provides quadrature at some of the outputs? I know it's not the same thing as in e.g. Shepard scale CV generators where voltage levels are the same on all outputs while only phase (of an LFO usually) is shifted in fixed division steps - but do some of the outs on a JAG produce such a phase shift? Looks great. I'll have to get one after I get a "New Controller" for completion sake. Brilliant additions to a module I already use all the time. Nicely done Cary! Would you take a New Controller as a partial trade? I do love the look of those little fresnel caps on the LEDs. I use something similar in all my DIY work! The only way you would get a regular phase shift out of the JAG would be to drive it with phase locked waveforms (like the one included). If you do that, you get eight overlapping peaks spaced evenly around the circle. I'm curious what the width of the unit is? Also the depth? Could it be "skiffed" in a custom case? Regardless I could look at this thing all day long, wonderful work! If it's like the others it should be 3U (I think) and 19" standard rack width. Oh, and this new version looks great! Fantastic additions. Thanks, that's what I figured as well. 2U 19" wide, rack mountable. I can't give you an exact depth number just yet, (a couple of parts are going to change making the production version thinner than my prototype) but should be less than 2" deep. So, pretty shallow (not quite as thin as the 311B, but that was surface mount and this is through-hole and has a lot more circuitry). Really ties the knot together...p.i. One of my favorite things is to hit my Malekko JAG with the A-143-9. This controller is looking ideal. This is not helping my lust for starting a 300 case. Great, thanks for the info. Looking forward to this! I have PM'd you on that subject naturally. Nice work Cary it looks wonderful! very nice to finally see this back in production. i've owned a black and a blue 311 over the years, and both were amazing. this new issue looks even better.